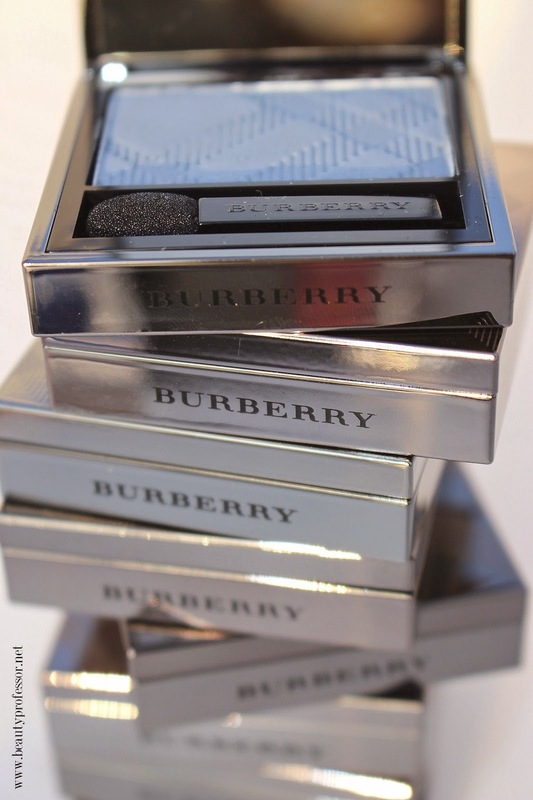 For the last couple of weeks, I have had the privilege of playing with the freshly-releaed, ever so luxurious Burberry Wet & Dry Silk Eyeshadow (available at Nordstrom and Burberry) and Wet & Dry Glow Eyeshadow. These comely gems come in a variety of hues and finishes for the ultimate in eye artistry. 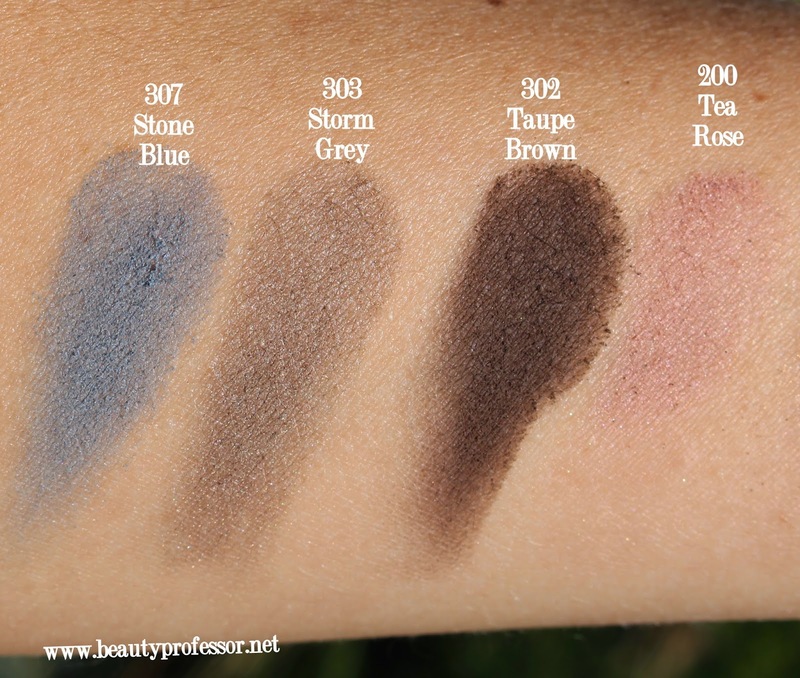 I am beyond pleased to be able to share a copious amount of images of eight specific shades in this post...after nearly 14 days of experimenting, I can confirm that these eyeshadows are buttery smooth, delightfully pigmented and stunningly long lasting! Above: A decadent Burberry stack. Above: A seemingly infinite set of eye looks contained in but eight shades. The *Burberry Wet & Dry Silk Eyeshadow (available at Nordstrom and Burberry) and *Wet & Dry Glow Eyeshadow are spectacular. Housed in gunmetal compacts emblazoned with the iconic Burberry plaid, these vibrant rectangles of pigment (also embossed with Burberry plaid) boast an incredibly silky texture while simultaneously yielding impressive color payoff. The shades I had the distinct pleasure of trying were safely nestled in the neutral section of the color spectrum (with the exception of Stone Blue), making them endlessly easy to integrate into my daily eye routine for work. This enabled me to test their blendability, finish and lasting power in realistic situations (like a 10 hour teaching day)! They are finely milled for maximum blendability and smooth, even application. There is no powdery fallout, even when applied heavily. The color payoff is immense for both formulas; these shades are well worth the splurge! The Silk formula has a combination of rich, creamy matte and complex satin finish shades. The Glow formula has a gossamer texture that is ethereally gorgeous. I love using Shell and Optic White both as eyeshadow accent shades as well as employing their powers as whisper-light highlighters. The shades with a satin finish (as well as those in the Glow family) are radiant without running the risk of translating as "glittery." This makes them chic, sophisticated and apropos, even for those that are shimmer-phobic! The lasting power is significant; applied dry and without primer, I get 7-8 hours of creaseless, touchup-free wear. Overall, I am wildly impressed with both formulas! Effortlessly blendable and easy to apply, Burberry Beauty Wet and Dry Eyeshadow is a weightless formula that creates a silky-smooth texture on the skin while remaining smooth and flexible. Using next-generation technology, the eyeshadow can be mixed with water for saturated color effects and precision lines or dry for a more natural, buildable finish. Burberry Beauty introduces Eye Colour, the new collection of single eyeshadows designed to be applied dry for a natural sweep of color or wet for a more intense result. Each Glow Eyeshadow features a gel-like texture, brightening reflective shades and a pure, crystal-clear finish to open the eye. Wear the individual shade alone or blend it together with another hue for infinite effects. Above: Wearing a combination of Pale Barley and Shell on my lids for a glowing pale taupe effect. Above: Optic White, from the Glow formula, is a luminous, translucent white that be used for accent and highlight. Above: Shell, from the Glow formula (also featured HERE), is a shimmering champagne-meets-taupe for a tender neutral eye. Above: Stone is a creamy matte beige. Above: Pale Barley, from the Silk formula, is a light taupe beige with a satin finish. Above: Tea Rose, from the Silk formula, is a creamy, cool toned mauve pink with a matte finish. is a mid-toned khaki-meets-grey with a satin finish. Above: Taupe Brown, from the Silk formula, is a deep, rich, matte neutral brown. is a fresh, soft blue with an opaque matte finish. 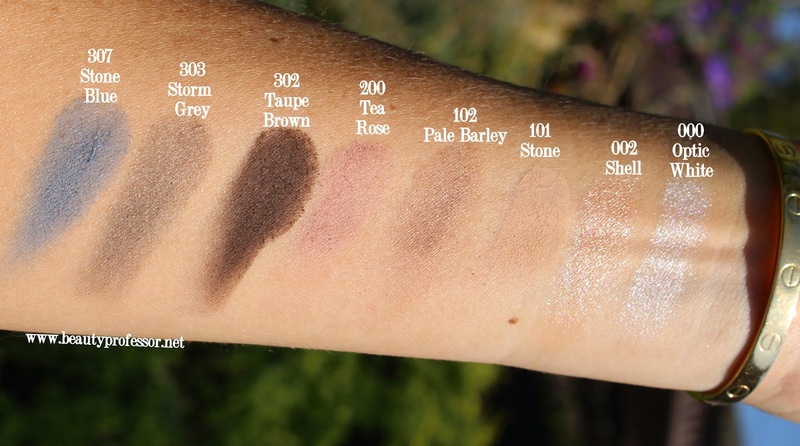 Above: Swatches of all eight shades in direct sunlight...each swatch is representative of a single swipe, thereby reflecting their powerfully smooth pigmentation. Above: Also wearing the new Burberry Kisses Lipstick in Devon Sunset (a myriad of shades to be featured on BP in the very near future!). Above: Last look...Burberry eyeshadows in the golden hour. Bottom Line: I hope you enjoyed this eyeshadow overview...from their buttery smooth texture to their color drenched shades, the Burberry Wet & Dry Silk and Glow formulas are utterly exquisite! Have YOU tried the new Burberry eye shadows? Thoughts? Good things ahead, including a fresh By Terry closeup (featuring a review + additional swatches of the new CC Cream previewed HERE), more Burberry and some marvelous beauty event announcements. I also have a video tutorial and skincare update in the works! I have the Almond eyeshadow in the old formula and wanted to eventually pick up Pale Barley...but how does the new formula compare to the old formula? 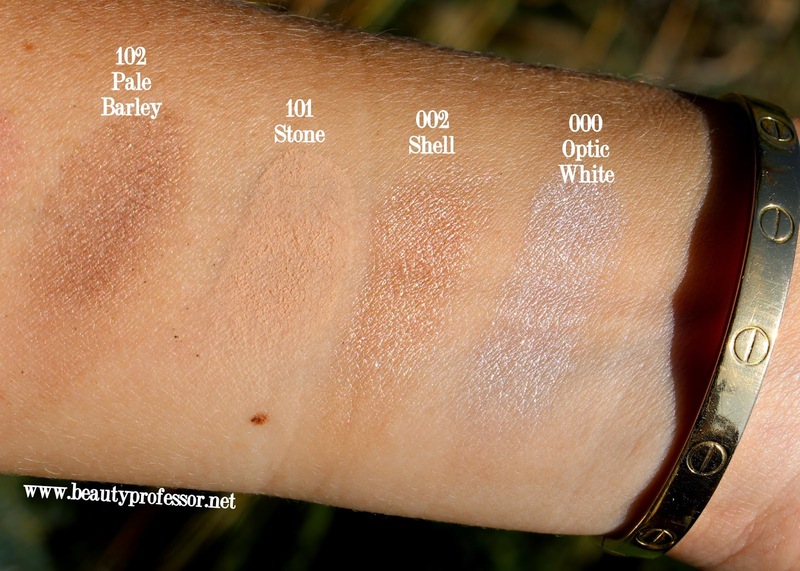 Seems like the new formula's texture is just as smooth, but what about the pigmentation? i.e., how does the pigmentation of the old Pale Barley compare to the new Pale Barley? Hopefully it's the same! I haven't noticed any major differences between the old and new formula and most Burberry lovers seem to have reported a similar conclusion; the new shadows are just as smooth, buttery and pigmented as ever, although I've heard that the shade is ever so slightly different with Pale Barley. I don't have an old one to compare it with, however! Do let me know your findings! Tea Rose and Optic White are my favorites. Marvelous, Clever Girl...they are both wonderful choices. Yes, Tequila...good eye! Both shades are so glowing and brightening without being glittery...I am totally loving the Glow formula for bringing life to tired eyes.